Traditional wedding cakes, your days are numbered. If you were to make the argument that wedding cakes occasionally look a whole lot better than they taste, I wouldn't stop you. They're so labor-intensive that they often come together over the course of several days, meaning that by the time they hit the buffet table they can be more than a little dry. (Also, your enjoyment of wedding cake may hinge on how you feel about fondant.) But you know what rarely disappoints? Cheese. That's why Costco just rolled out a 24-pound tiered wedding "cake" made from giant, stacked wheels of cheese. 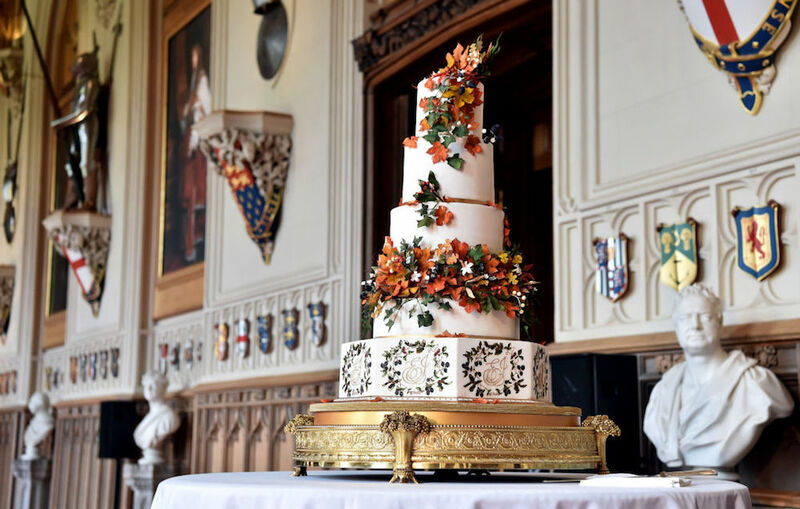 Dubbed the "Cheese Lover Celebration Cake," the impressive tower features enough Red Leicester, Danish Blue, Murcia al Vino, Tuscan Sheep's Cheese and Brillat-Savarin Triple-Cream Brie to feed 105 to 150 people (depending on how hungry your guests are). The whole setup costs $439.99 (shipping and handling included), and Costco promises that it'll arrive in two or three days once you order it from their website. There is some assembly required, though—you'll have to stack those cheese wheels yourself. 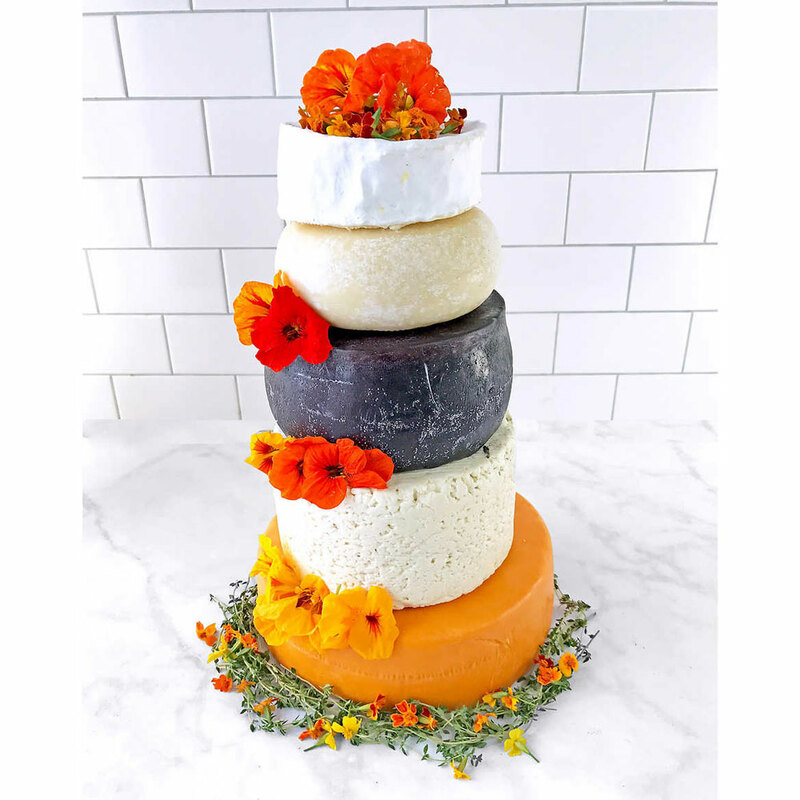 And while the photos on Costco's website show a cake decorated with flowers, it's sold unadorned (this could be a positive if you want to tailor that cheese monument to your wedding's color scheme). And former Ace of Cakes star Duff Goldman served a meat cake at his January 19 nuptials. 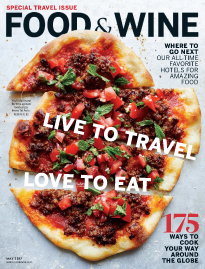 “The bottom tier is meatballs, the second tier is meatloaf, third tier is lamb shawarma, the top tier is scrapple,” Goldman told People magazine. “Then it’s iced in mashed potatoes, with bacon roses and then we have a chocolate fountain that we put gravy in.” The pièce de résistance: bride and groom cake toppers made out of hot dogs and sliced deli meat. Savoury wedding cakes are just as popular. This delicious cheese & pork pie cake went down a treat! 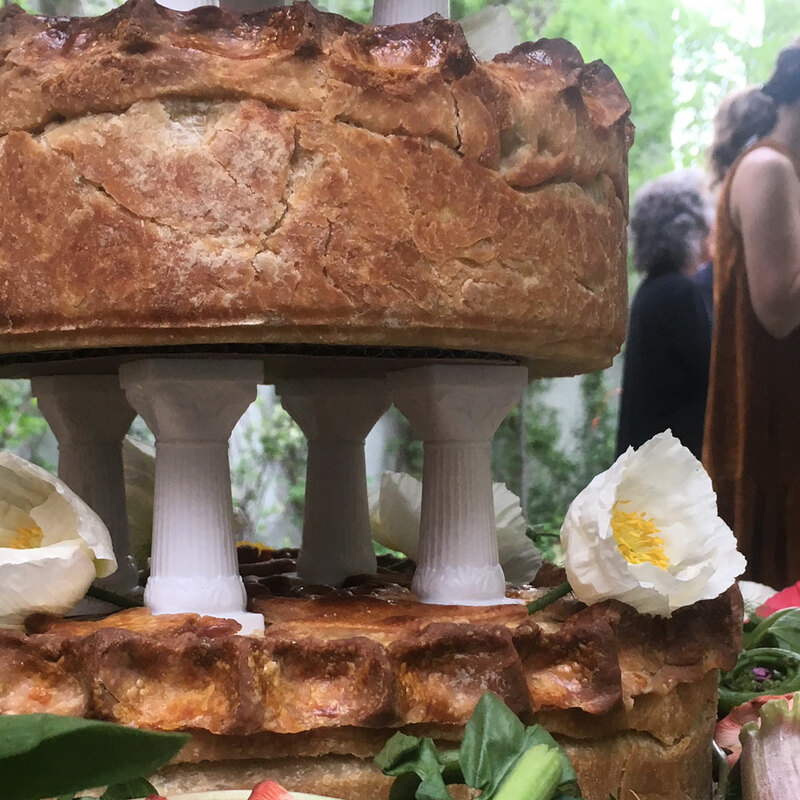 Of course, you could always combine meat and cheese into one savory wedding cake to rule them all, as British catering company Nibbles2Nosh did. Or, if you're really committed to this savory thing you could take a cue from Chrissy Teigen and John Legend and order one of California-based Bree's Cakes' signature "soul cakes" — magnificent structures made from cornbread layered with candied yam and mac and cheese fillings, frosted with mashed potatoes, drizzled with gravy, and topped with fried chicken and barbecue ribs. 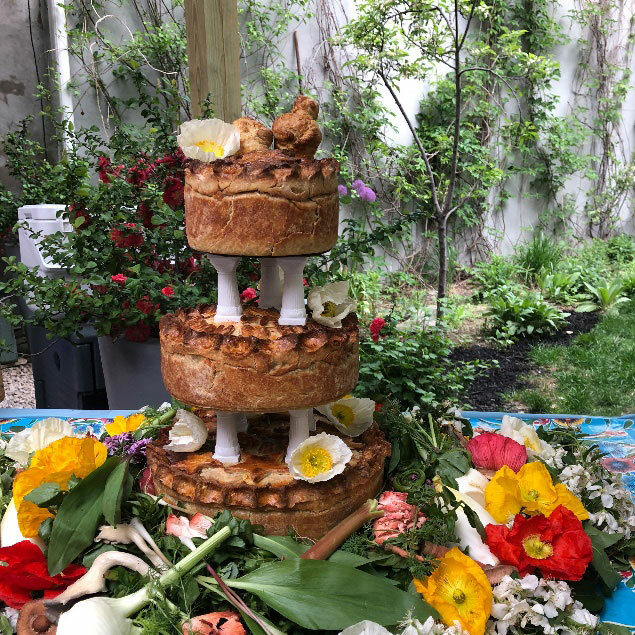 Will These Tiered, Meat-Filled Pies Replace the Wedding Cake?